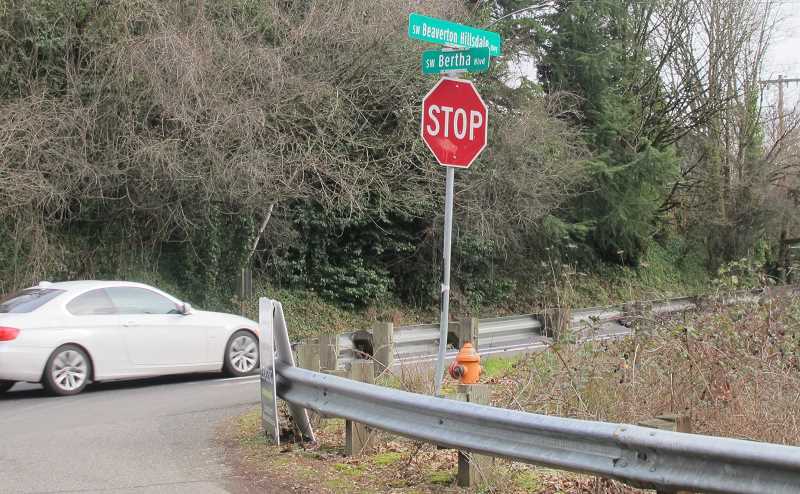 Southwest walkers, runners and bicyclists who've been waiting for a new elevated bridge across the ravine that's just below Beaverton Hillsdale Highway will have to wait at least another year. Plans to start construction on the Red Electric Trail Bridge at a spot across the street from Verde Cucina in West Hillsdale have once again been postponed. The Portland Bureau of Transportation announced the latest delay on Thursday Feb. 7. "Unfortunately, the project will be delayed for up to a year. The bids that we received at the end of November 2018 came in significantly higher than anticipated and we were not able to award the contract. This was a frustrating setback," the PBOT release reads. The proposed bridge would be 500 feet long and 14-feet wide and rise 14 feet above the ravine. People can see where it's to be built from the unimproved parking lot across Capitol Highway from Sasquatch Pub. A trail connection would extend the Red Electric Trail to Southwest Bertha where it continues at Beaverton Hillsdale Highway. The budget to build the bridge is $3.9 million. Work was to have begun in late February, cutting down trees in the area. Construction was supposed to start in May with the bridge completed by Spring 2020. If PBOT doesn't again postpone the project, construction won't start until then. PBOT says it won't go out for bids on the work until next November. "I'm very disappointed but I'm not surprised," said Don Baack, founder of Southwest Trails. "PBOT makes a habit of this. What they've done is put it off and put it off and put it off. As a result, we started with a $2 million project and it grows each year with inflation in construction costs. Because of their delays, the cost of this bridge has gone up dramatically." As a matter of fact, in narrating a video about the Red Electric Trail HYPERLINK "www.swtrails.org" www.swtrails.org Baack states, "An example of a key project that's underway and will be completed in 2015 is the bicycle and pedestrian bridge at the west end of Hillsdale." In November 2018, the project was still on track. PBOT's Capitol Projects Manager Nicole Pierce shared this vision of the bridge with the Portland Tribune, ""There's a look, if you're looking straight at the front of the bridge, that you're in the tree canopy level," Pierce said. "It will very much feel like you're in the trees, in the air." But not for a while. 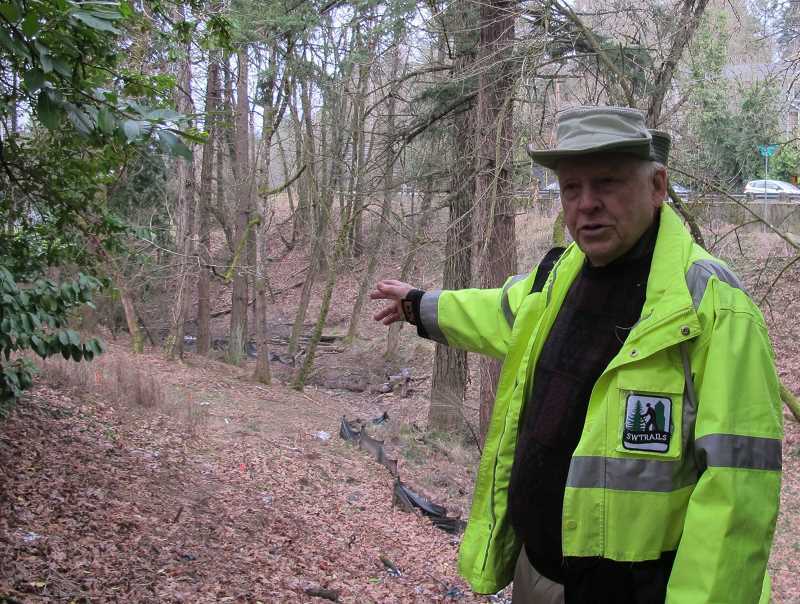 Glenn Bridger , a retired highway engineer who volunteers with the Hillsdale Neighborhood Association said he's not sure how the cost can be reduced enough to get the project on track. "I don't think that they're going to make enough in savings to make this delay worthwhile. I interpret this delay as PBOT saying they're going to be able to save money by redesigning some of the footings without changing the scale of the project. I have difficulty believing that," Bridger said. Debbie Small has lived for three years on Southwest Bertha, a block from what would be the west end of the bridge project. "Yes, I'm surprised and disappointed by this delay. It's been delayed before but we thought for sure this time it was going to go through." Like Baack and Bridger, Small volunteers on trail-building projects with SW Trails. Baack figures construction of the Red Electric Trail Bridge in West Hillsdale has now been postponed three times, the first time when fomer Mayor Sam Adams was the Commissioner in charge of PBOT. Volunteers already have done a lot to clear the path for a bridge. Pointing out the area where the bridge would start, he said,"This is so cleaned up from what it used to be. This was all covered with blackberry bushes. It was a mess. Some of the neighbors were hoping to build a small park here." 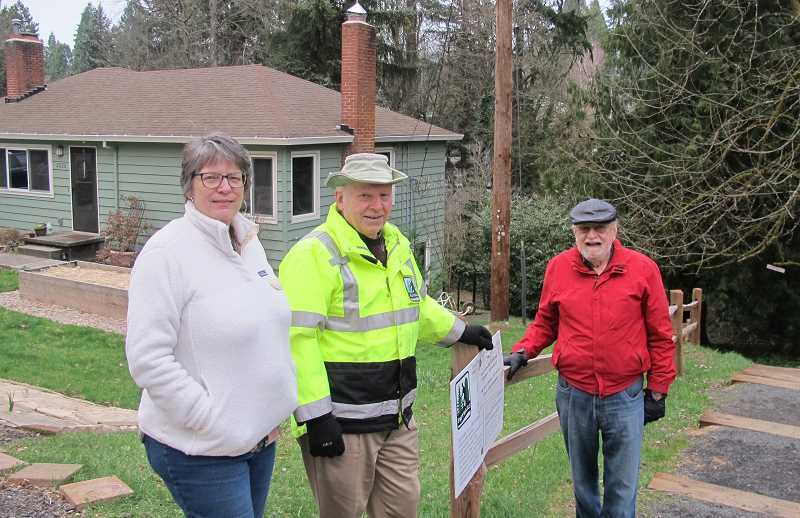 Work continues for SW Trails on other parts of the Red Electric Trail, which follows the old route of the Red Electric train line that ran from South Waterfront to the border with Washington County more than 100 years ago. SW Trails is trying to make as many segments of the old trail safer for walkers, runners and bicyclists.